Descriptive mapping describes the abundance and distribution of landscape values and special places on the landscape. In theory, landscape values and special places can be randomly distributed, uniformly distributed, or clustered on the landscape. Most empirical studies of landscape values show that landscape values tend to cluster around geographic places and landforms, although the extent of clustering varies by the type of landscape value being measured. The simple visual pattern of landscape value distributions can reveal important information about the location and intensity of landscape values. Hotspot mapping measures the density of landscape values and special places. Density is determined by the number of points within a given area. 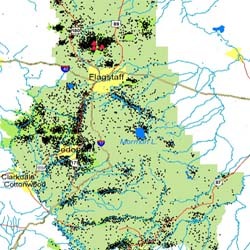 In GIS, density is usually calculated and displayed using either simple density (number of points per area) or kernel density (density that is smoothed through a mathematical function). Hotspots represent higher densities of landscape values and special places than the surrounding area. Visually, hotspots reveal a mosaic of patterns on the landscape. Special managerial attention is warranted for landscape value hotspots. 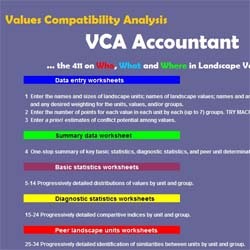 Values compatibility mapping determines the relative compatibility of various land management options for a management area by examining the mix of landscape values found in the management area and the compatibility of those values with the potential management option. Landscape values are tabulated by management area or unit in GIS and then processed using an Excel-based compatibility model. Distance analysis examines the proximity of landscape values and special places to other geographic places. 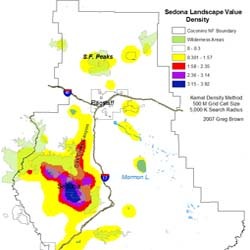 For example, the map to left shows the distances of landscape values by Sedona (Arizona) residents to places on the the Cococnino National Forest. It is known that humans engage in spatial discounting--they like to be near positive landscape features and distant from negative landscape features. Spatial discounting influences the spatial distribution of landscape values. 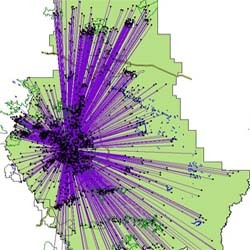 Community mapping combines the features of hotspot mapping with distance analysis. Community maps display the abundance and distribution of values on the regional landscape by residents of a given community. Many communities tend to express a unique pattern of landscape values in their region. Community maps are influenced by a variety of variables, but type and ease of access to the surrounding region are two of the more important variables influencing the revealed community map. Land managers who treat communities as having similar landscape values for the region are likely to be wrong. Community values matter in land use planning.